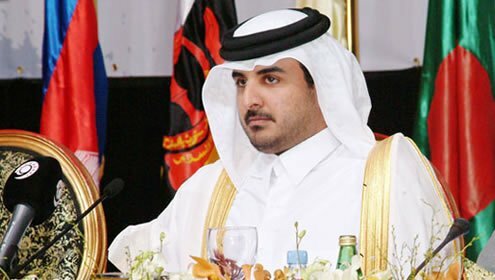 The Qatari Emir Sheikh Hamad bin Khalifa al-Thani is to announce he is ceding power to his son, Crown Prince Tamim bin Hamad al-Thani, reports say. Rumors had been circulating for days that Crown Prince Tamim bin Hamad al-Thani, 33, was being prepared to take over leadership of the Gulf emirate. The Qatar-based al-Jazeera television station reported that Sheikh Hamad told a meeting of the “ruling family and top advisers” of his decision on Monday. A formal announcement is expected on Monday evening. Sheikh Hamad will address the nation at 08:00 local time on Tuesday morning, according to the official QNA news agency. Tuesday has also been declared a national holiday. A cabinet reshuffle is also expected as part of the changes in the government line-up. Qatar has been dominated by the Al-Thani family for almost 150 years. Sheikh Hamad took power in 1995 when he deposed his father to become emir. Since then he has introduced some liberalizing reforms and in recent years has made Qatar a major player in regional diplomacy. Analysts say Crown Prince Tamim is unlikely to deviate far from his father’s policies. Crown Prince Tamim chairs the 2030 Vision project which outlines the development goals for the country and has a clear liberalizing social agenda. The project has had significant input from his mother and Sheikh Hamad.